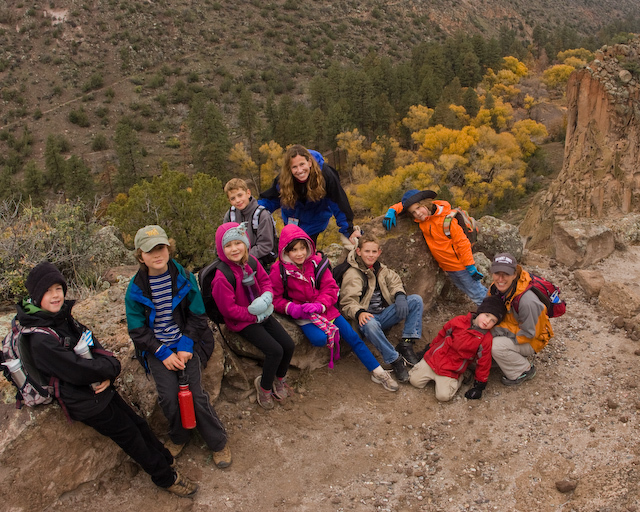 Journey to Bandelier via the Frey Trail! We had a unique vantage point of Bandelier National Monument today as we hiked from the Juniper Campground down to the Main Loop today via the Frey Trail. It was stunning looking down into Frijoles Canyon at the peaking yellow cottonwoods below. What a treat! We began our day with a ride in the awe-inspiring adventure van – singing songs while learning the 50 states! Before our hike we heard the Dine (Navajo) Creation story, and then took off on our big hike, all eager to have a turn leading the group! Once down in the canyon, we explored several caves and the main ruins. We tried to imagine life in this canyon several centuries years ago and each did a journal entry to this effect. We stopped to look at and learn several of our common New Mexico conifers using a dichotomous key (learning some fancy words as we did so!) Overall, a beautiful, refreshingly cloudy and uplifting day! Thanks to Katie Cutter and Zachary for extra hands (and little legs!) on our adventure!